It may not be British Mesolithic, and it may be oldish news—originally press-released in 2011—but these discoveries still chill the soul. Visually macabre they may also be, but they offer ultra-rare glimpses of hunter-gatherer behaviours and social complexity. The site, discovered ahead of a railway construction, would have been interesting anyway, even without the extraordinary finds. Adapted from original press release and online sources. Analysis continues and final reports are still some way off. Photos Fredrik Hallgren / Stiftelsen Kulturmiljövård. 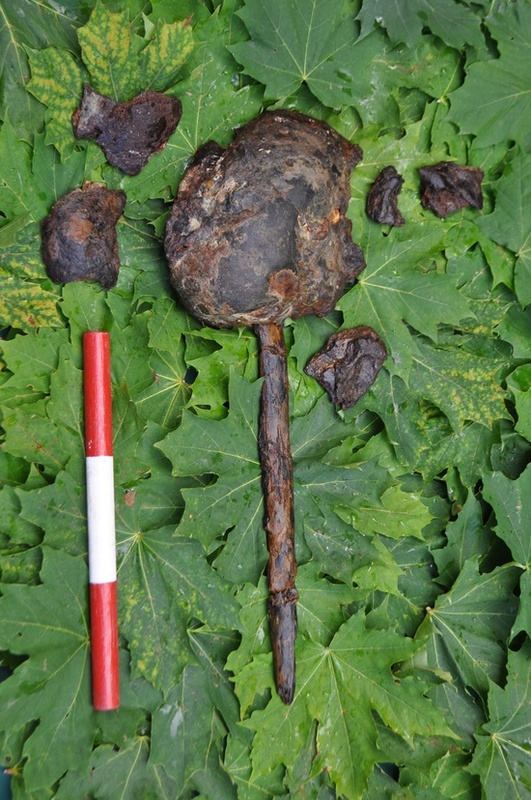 Archaeological excavations at the site Kanaljorden in the town of Motala, Östergötland in Central Sweden (2009–11) unearthed a complex Mesolithic site with ceremonial depositions of human crania in a small lake. The skulls have been handled through a complex ceremony that involved the displaying of skulls on stakes and the deposition of skulls in water. The rituals were conducted on an enormous (14×14 m) stone-packing constructed on the bottom of a shallow lake. Based on the more intact skulls eleven individuals have been identified, both men and women, ranging in age between infants and middle age. Two of the skulls had wooden stakes inserted into the cranium. In both cases the stakes were inserted the full length from the base to the top of the skull. In another case a temporal bone of one individual, a woman, was found placed inside the skull of another woman. 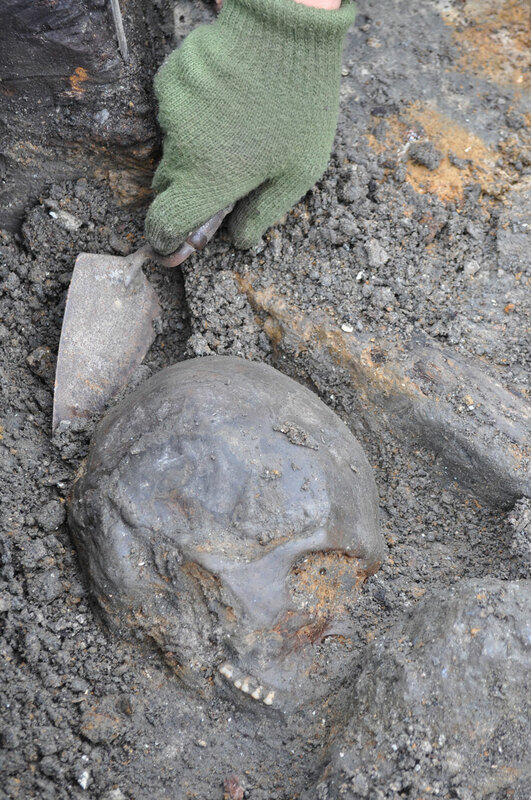 Besides human skulls, the find material also included a smaller number of post-cranial human bones, bones from animals as well as artefacts of stone, wood, bone and antler. The skulls have been dated to 6212–5717 Cal BC and two dates on worked wood 5972–5675 Cal BC), making them seven to eight thousand years old. 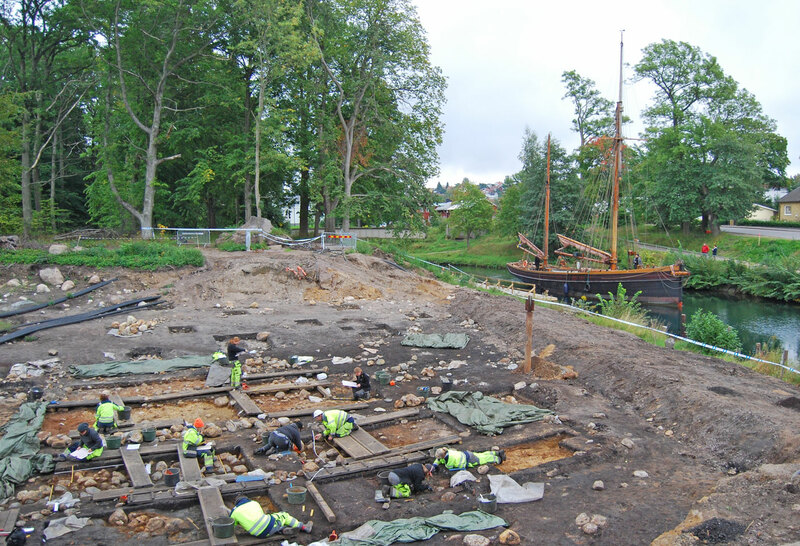 The excavations were conducted by Stiftelsen Kulturmiljövård, led by Fredrik Hallgren, in advance of the construction of a new railway. 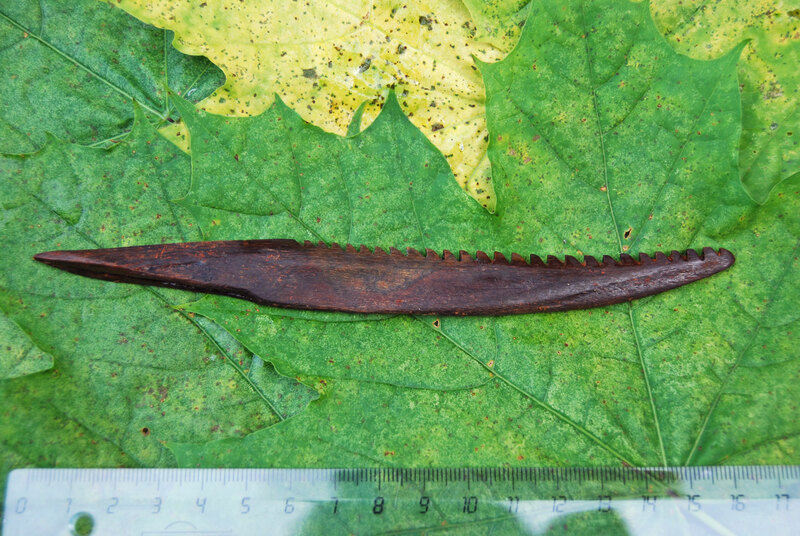 This entry was posted in Digs, Hunter-gatherer-fisher, Mesolithic, Sites and finds and tagged Archaeology, Excavation (archaeology), Kanaljorden, Mesolithic, Motala, Strandvägen, Sweden by Spencer Carter. Bookmark the permalink. If a stake is inserted all the way through the hole for the spinal column to the top of the head, doesn’t that imply, after death? And to a dismembered body? The thought that struck me was staking after death and exposure of the remains to the elements. No basis to that at all, of course! Hi Nicky, yes, definitely dead, but how close to death is unclear at the moment I think. The team are looking at the possible processes involved, also whether the skulls were above or below water, visually. I was lucky enough to see Fredrik’s heart-stopping presentation at the MUGE150 conference in Portugal in March (Mesolithic shell middens, also with dead bodies in them). They’re looking at things like Strontium isotopic analysis to see how the people moved around the landscape – one can tell differences between the place of birth/youth and the “final resting place”. Oxygen isotopes can suggest a geographic origin too. Carbon13 and Nitrogen Stable Isotopes also lets one look at dietary traits (meat, fish, plants). And were they related? Who were they?